Derry footballers secured their first silverware at Croke Park since winning the Division 2 league title in 2013 when they picked up the Division 4 trophy at headquarters. Leitrim had been the headline story of the league campaign but they were outclassed by a physically stronger Derry side who possessed too much firepower for the Connacht side. The Ulstermen weathered an early Leitrim onslaught during which the underdogs secured a 0-6 to 0-3 advantage. But backed by the breeze they wasted too many chances – kicking nine first half wides and once Derry settled they outscored their opponents 7-1 during the remainder of the half. 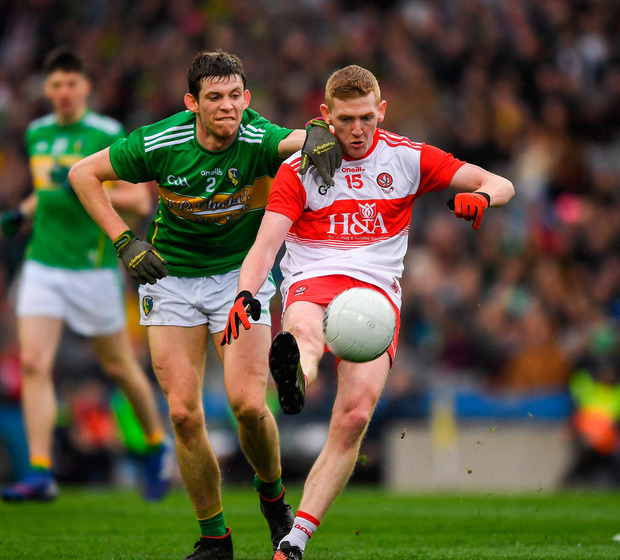 Despite Leitrim’s bravery, Derry controlled the second half – outscoring the Connacht side 10-9 and the challengers only once threatened to score a goal which might have changed the course of the contest. Derry have gone through the league unbeaten and now they have to prepare for the challenge of taking on next door neighbours Tyrone in the Ulster series. Almost sixty years to the day since Leitrim’s Croke Park debut in the 1959 Division 1 National football league semi-final, the Connacht minnows were back at headquarters for only their fifth ever appearance at senior level. In a remarkable coincidence, Derry provided the opposition on both occasions – this time around the Division 4 League title was up for grabs but essentially it was a lap of honour for the two teams who had both secured promotion with two rounds of fixtures to spare. For Derry – who played in Division 1 as recently as 2015 before tumbling straight down through the divisions in the next three seasons – their promotion was the first sign of recovery sprouts being developed. Leitrim are on an altogether different trajectory; this was their first appearance at Croke Park since 2006 when they were beaten by Louth in the Tommy Murphy Cup final and they had failed on ten successive campaigns to secure promotion from Division 4. No wonder Croke Park was thronged by thousands of Leitrim fans who gave the team a rapturous reception when they emerged from under the Cusack Stand. Leitrim adopted a defensive formation – keeping just two forwards up front with veteran Emlyn Mulligan operating on the edge of the square. They took the lead after just 55 seconds through Dean McGovern. There was no shortage of entertaining football with four more points scored in the opening five minutes with Derry holding a slender one-point advantage. Gradually the packed Leitrim defence got on top and, aided by the breeze, they hit a purple patch hitting four points on the spin between the 11th and 17th minutes to take a 0-6 to 0-3 advantage. They also kicked five wides including two frees. Two of those misses came from Ryan O’Rourke but the corner-forward did kick the best point of the half – a wonderful effort from under the Hogan Stand. The second quarter belonged to Derry, however, with the Ulster side upping their scoring rate and outscoring their opponents 7-1 between the 21st and half time. The centre plank of their attack did most of the damage with centre forward Enda Lynn and Ryan Bell kicking six points from play between them. Leitrim, in contrast, failed to score in the last 15 minutes of the half which included three minutes of injury time. The Derry defence got completely on top and significantly two of Derry’s nine points from play came directly from turnovers deep in their half. So Derry were in the driving seat at the break leading 0-10 to 0-7 while Leitrim were left to rue their missed chances, kicking nine wides compared to four for Derry. Facing into a stiff breeze, Leitrim needed to make a positive start to the second half and they did with Emlyn Mulligan kicking a point after 35 seconds but it took a brilliant save from Leitrim keeper Cathal McCrann to deny Emmet Bradley a goal. Leitrim upped their scoring rate but Derry comfortably kept them at arm’s length and with judicious use of the wind they starting to kick long range points with Shane McGuigan, who hit 2-5 when the sides met in round 6 of the league, hitting a spectacular brace. Derry were now using their superior strength to break the Leitrim tackles and had stretched their lead by five points (0-15; 0-10) with 20 minutes left. Two points on the spin from Evan Sweeney and full back Michael McWeeney, which cut the deficit to four points, briefly raised Leitrim’s hopes in the closing ten minutes. But as they had done all season Leitrim finished very strongly and Derry full back Brendan Rogers had to be alert to grab a ball which was heading over his goal line in the dying minutes, but the Ulster side held out to seal the win and earn the silverware with Shane McGuigan who kicked six points winning the official Man of the Match award. Derry: T Mallon; K McKaigue, B Rogers, P McNeill; M McEvoy, C McKaigue (0-2); N Keenan; E Bradley (0-2) C McAtamney; P Cassidy (0-1), E Lynn (0-3), C Doherty; S McGuigan (0-6, 1m, 1f), R Bell (0-4, 1f), C Bradley (0-1, 1f). Subs: B Heron for Lynn 50m; N Toner (0-1) for Bell 50m; J Rocks for Doherty 59m, Eamon McGill for K McKaigue 64m, R Dougan for Bradley 70 +1.